The earliest images here date back to August 2004 and to my first DSLR ~ the Nikon D70. That is so beautiful....great series,vote. Great work all along this colorful gallery. Each image shows a lot of sharp details on these beautiful butterflies and is very well composed. V.
Wow, you have some stunning images here. 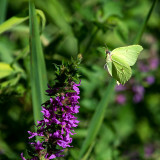 V.
Beautiful collection of butterfly images, wondeful compositions and colours V! A very nice collection of butterflies on beautiful flowers.